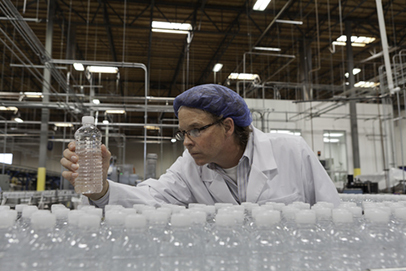 Niagara Bottling LLC has recalled all spring water products produced at its two Pennsylvania facilities between June 10-18, 2015, after being informed that the water source was potentially compromised by E. coli bacteria. The company added that no reports of illness or injury had been received to date, and that finished product testing had not detected any contaminants or other issues. The bottled water has Niagara Bottling LLC on the label and is sold under the following brand names: Acadia, Acme, Big Y, Best Yet, 7-Eleven, Niagara, Nature’s Place, Pricerite, Superchill, Morning Fresh, Shaws, ShopRite, Western Beef Blue, and Wegmans. Stores recalling the bottled water products include Wegmans, ShopRite, 7-Eleven, Acme and others. According to a notice posted June 19 by Niagara, the recalled water should be boiled for one minute and cooled before being used. “Boiling kills bacteria and other organisms in the water,” the notice stated. Consumers may also return the recalled product for a full refund, the company stated. “E. coli are bacteria whose presence indicates that the water may be contaminated with human or animal wastes. Microbes in these wastes can cause diarrhea, cramps, nausea, headaches, or other symptoms. They may pose a special health risk for infants, young children, some of the elderly and people with severely compromised immune systems,” the Niagara notice stated. The bottling facilities where the recalled spring water products were produced are in Hamburg and Allentown, PA, and the production occurred between 3 a.m. EDT on June 10 to 8 p.m. EDT on June 18, 2015, Niagara stated. The code information on the bottle will reveal whether it is part of the recall. It shows the place, date and time the product was produced. Only the bottled spring water with codes beginning with “F” or “A” are affected, the company stated. The first digit after the letter indicates the number of the production line. The next two numbers indicate the day, then the month in letters, the year, and then the time, based on a 24-hour clock. For example, A610JUN15 2000 means produced on Allentown line 6, manufactured on June 10, 2015, at 8 p.m. A list of the recalled lots with case codes and best-by dates can be found here. For more information, contact Niagara Bottling LLC Consumer Service at (877) 487-7873. For additional information on OSHA training from Spectrum Training Services, visit our Illinois OSHA Training page. Or if you interested in learning more about OSHA training NOW, please call 847-780-8944 and ask for Kenye. You can also use our Contact form.